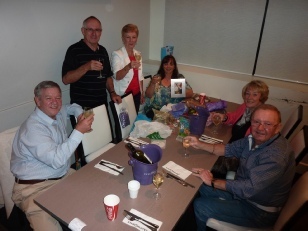 On Friday 28th March 2014 a group of Billy’s friends and former colleagues held a belated wake at Bankstown RSL Club. Jennifer Shaw (McIntyre) writes: In the picture hereunder, seated on the left is Highland dancer Mick Pratt, who has just retired from Channel 10 Sydney and is now consulting, designing sets for TV shows (which he did full-time) and events, an all-round great guy who, despite his solid build, dances as light as a feather. Standing next to him is Robert Pearce (ex-Pipe Major), OAM for piping services, particularly for years of playing and leading the Anzac Parades in Sydney, winner of many awards. Billy used to send him up on stage by saying his mother was the judge!!! Next to Robert is myself, dubbed by Billy as “Scotland’s Nightingale of Song”, Jennifer Shaw. Seated is Christine Hasiuk, who knew Billy longer than most of us. She was one of a group of Highland dancers he used for TV and stage show. I first worked with her when she was just a teenager in Billy’s shows at the Manly Music Loft, where we did a season of Scottish Theatre Restautant. She is of Polish descent and had discovered that her grandfather had been interred in Scotland during the War. Christine is holding a photo of Billy which my husband thought to bring. Across the table are Ray and Arthur Spink, who regaled us with tales of Billy & John visiting them, enjoying a ‘drappie’ or two (or more), refusing to stay and driving back from Campbeltown to the Eastern suburbs where they lived at the time - obviously in the days before drink driving! We all had many tales to tell of occasions with Billy. He was a great character who is sadly missed. Thanks for the memories, Billy.